Full Circle Podcast #3 Hail the Mental Mongoose is here! Full Circle Magazine #35 is here! 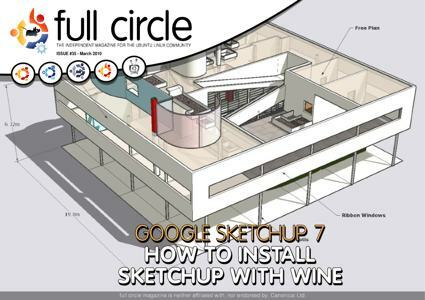 Installing Google SketchUp using Wine. Top 5 – Android Applications. X-session unable to launch "/usr/bin/start/xde" X-session not found "/usr/bin/start/xde" falling back to default session. on re-start. A little x-session voodoo? Why not take the Linux tech survey as which quite a few "youtubers" are answering and we've put in the Full Circle Podcast ep#3. 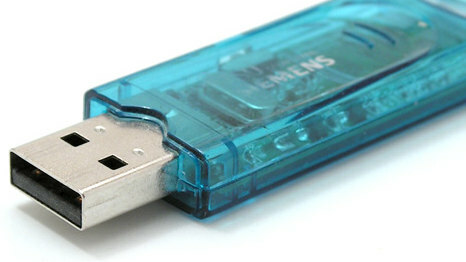 Posted by Waqar M, alias "knowmorecomp" (http://www.youtube.com/watch?v=gqoEHgITqQw). Text of the survey is at http://dl.dropbox.com/u/1809188/Linux%20tech%20survey. 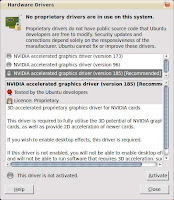 The bad news is: I did it by removing the proprietary nVidia drivers! I had long suspect that Audacity's GTK front-end quarrels with the proprietary nVidia graphics drivers BUT ONLY on my Dell laptop. The nVidia card in this Dell was never rated as great, more of a workhorse, with some hardware implentation issues somewhere along the way. How did I make the link? VirtualBox offers its own Guest Additions for improved integration between guest and host, particularly mouse-capture and more video resolutions. The guest-additions are installed to the guest, not the host. It is an essential for best performance. The name Lubuntu is a combination of LXDE and Ubuntu. 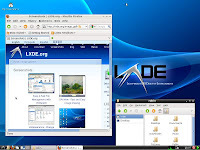 LXDE stands for Lightweight X11 Desktop Environment. 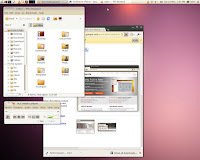 The objective of the Lubuntu project is to create a variant of Ubuntu that uses LXDE, the Lightweight X11 Desktop Environment, as its default GUI. There's been a huge fuss over the default layout in the new Ambiance and Radiance Light themes in Lucid Lynx. Namely, the Window controls (minimise, maximise, close) being in the top left corner, not the right as we are all accustomed. But it's surprisingly easy to fix, even if it's buried in the arcane black arts of 'old Linux'. It's a one character change in one line of the gconf file. Warning: do not edit anything else in the gconf file unless you know what it does, you will wreck your x-windows session. The leading colon is significant, this sets the window controls to left or right aligned depending on its position at start or end of the line. Following my minor rant about the Blogger NavBar and why its such a stylistic and artistic bad idea, here's how I dealt with it. 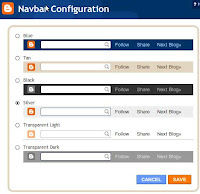 Most of the Blogger Templates use iframes to load the NavBar, styled with a CSS block ID named navbar-iframe. So we can use standard CSS formatting to move, hide or otherwise layout the NavBar as we wish. It's been about a month on the new blog platform. Well past the time to fix the hideous template I chose by default (they were all pretty hideous). These were all done through the Dashboard, Layout tools. Sorry about the title, couldn't help myself. 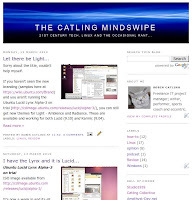 If you haven't seen the new branding (samples here at https://wiki.ubuntu.com/Brand) and you aren't running the Ubuntu Lucid Lynx Alpha-3 on trial (http://cdimage.ubuntu.com/releases/lucid/alpha-3/), you can still get new themes for Light - Ambience and Radiance. These are available and working for both Lucid (9.10) and Karmic (9.04). It's now a week in and its all running sweetly. Got the new look, themes, branding. Improved software centre has a habit of giving me a crash report whether it has crashed or not (??). The disastrous lack of stability finally got to me. Too many strange things, lock-ups, crashes... Audacity going AWOL at random intervals, to the point where you have to kill the process, the crash recovery doesn't work any more and the saved project file locks up when re-opened! !